Colombo Dockyard PLC celebrated 37 years of excellence this year and is looking forward to capitalize on rapid progress in the shipping industry. In an interview with Daily News Business, Colombo Dockyard PLC Managing Director and CEO Mangala P.B. Yapa elaborated on its 37 years of excellence. Sri Lanka has a background for shipping related industries and was renowned as a major center for trade. The turning point in the recent shipping history was the formation of Ceylon Shipping Corporation in 1972 as a national carrier that gave birth to new shipping industry in the country. As Sri Lankan government own National Carrier was established there was demand and capacity locally for ships repairs and building. In 1978 existing facilities with the Port were handed over to the Colombo Dockyard Ltd., a newly established entity, a subsidiary of Ceylon Shipping Corporation. There were challenges for Colombo Dockyard as an upcoming small shipyard. The three fold challenges were harnessing manpower (skills and competencies) ship repairs, business development and acquiring technology. Whilst collecting locally available skilled labour extensive training programs were launched in conjunction with National Apprenticeship Board (now NAITA) to develop the skills needed for the future. Both local and foreign graduates and sea-going engineers were attracted to Colombo Dockyard and further developed to meet futuristic demands. As ship repairing is predominantly labour intense business, finding skills and competence to carry out activities were difficult. It was a challenge to attract international business as there was a small ship ownership in Sri Lanka. During that era the country was renowned as a predominantly an agricultural nation, with less prominence given on technology advancements. Colombo Dockyard had to move forward as a pioneer in the Sri Lankan Industrialization, to keep abreast with the global technology advancements, which was a huge challenge. Business was not available in the local market. Thus, it was inevitable for Colombo Dockyard to move into export oriented markets from day 1. Acquisition of new technology was done first through DANIDA Development Program and subsequently through JICA Training during early days. Being an institution under the purview of Ministry of Shipping, Colombo Dockyard was able to attract many such opportunities. 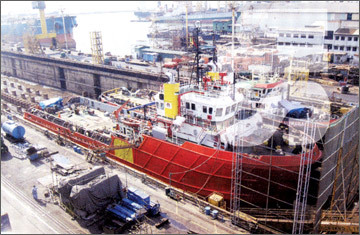 After privatization in 1993, the Japanese shareholder, Onomichi Dockyard played a pivotal role in uplifting the technology and transforming the organisation culture to what it is today., Today the success of Colombo Dockyard proves that all these challenges were well addressed and successfully faced. 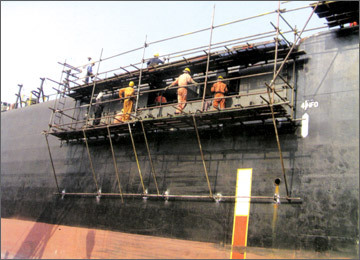 The skilled and competent engineers for ship building industry is the need of the hour. There is no university curriculum to produce these skills and government policy needed to address such requirements. Building human capacity at national level to meet today's as well future demand is essentially needed. The business development was not an easy task. The Colombo Dockyard was able to build its own brand name on its core values. The core characteristics of that brand goes beyond Sri Lankan boundaries and the company today is well established in the Asian sub- continent. The quality of product, service delivery and safety are the critical issues. The Colombo Dockyard has competed 9,000 jobs and most of the callers are repeated callers. The main focus is the customer where customer centric approach is practice to attract businesses. The 60 percent of business are from India at present and the challenge to attract businesses from other markets has been met successfully. The Colombo Dockyard sustained and expanded businesses in 1983 with a single largest private investment of US $ 42 million. The company has earned $ 1.1 billion during its 36 years of operation. The company found it difficult to move forward at the inception, since there was no shipping industry as such. Today Colombo Dockyard is renowned for its technological capability positioning well within the modern day know-how. The company has achieved high results as a single entity in the country. "The 3,000 workforce at Colombo Dockyard is highly skilled, productive, disciplined, committed and loyal. The company has performed extremely well and today accounts for 1.5 percent of total exports to Sri Lanka. It practices different business model from the inception with main focus of business development and upgrading of technology in Sri Lanka. "The company has a market capitalization of Rs 18 billion at present. All this great milestones are achieved utilizing a land area of 25 acres within the port of Colombo operating four graving drydocks for our core business of Ship Repairs, ship building, Offshore and Heavy Engineering," Yapa said. Three local government officials were sacked after 12 people, including nine schoolchildren, lost their lives when an overloaded ferry boat sank in central China, state press said Sunday. The accident occurred Saturday on a river in Shaoyang city, Hunan province when the ferry capsized with 50 people, including 41 school students, on board, the China News Service reported. Eleven people were initially reported killed but searchers Sunday found the body of one person who was missing, it said, adding that the toll could rise further as the boat had not yet been lifted from the river bottom. Three local officials, including the vice head of Shaoyang county, have been sacked because of the accident, while police have detained for questioning the boat's owners and workers who were dredging the river, Xinhua news agency said. Officials said the ferry sank after it cut across dredging cables that appeared to then become wrapped around its propeller, Xinhua reported. The Hunan transportation department said the boat was designed to carry only 14 people, the report said. Thousands of men from Myanmar and Cambodia set sail on Thai fishing boats every day, but many are unwilling seafarers - slaves forced to work in brutal conditions under threat of death. The day Hla Myint saw the sea for the first time was when traffickers delivered him, after a week's trek through the jungle from Myanmar, to a ship on Thailand's coast. He said it was the beginning of seven months of ``hell", during which there were beatings ``every day, every hour". His is one of a multitude of stories of slavery in Thailand's multi-million dollar fishing industry, which campaigners say relies on forced labour to provide seafood for restaurants and supermarkets around the world. Hla Myint decided to escape - throwing himself into choppy waters and clinging to a life buoy for five hours before reaching land - after seeing his captain kill a crewmate.